The Philippines President Benigno Aquino III delivers his State of the Nation Address (SONA) during the 15th Congress at the House of Representatives in suburban Quezon City, north of Manila, Philippines on Monday, July. 25, 2011. The Philippines President Benigno Aquino III stressed on the economic gains and anti-corruption efforts of his one-year-old administration in his State of the Nation Address (SONA), but industry participants believe much remains to be done to sustain the country's growth. "This is Aquino III's first year in office so he's still in the preparatory stage. But we expect that in the next few years, he will be able to improve the country's investment climate," Miguel Varela, president of the Employers' Confederation of the Philippines, said. Varela said that with more investments, more jobs will be created, unemployment and poverty reduced. Sergio Ortiz-Luis, president of the Philippine Exporters Confederation, also has modest expectation of Aquino's first year in office. But in the next 6 months, Ortiz-Luis said that businessmen "expect some improvements" under Aquino's leadership. Jobless, poverty and lack of investments are some of the problems that beleaguer this developing Southeast Asian country. Aquino tackled these concerns in this year's SONA. In his speech delivered Monday (July 25, 2011) at the opening of the 15th Congress' second regular session, Aquino said that under his term, the government was able to reduce hunger incidence, attract more investors and boost the local stock market. Aquino said the credit upgrade extended by international credit rating firms such as Moody's, Standard and Poor's, Fitch and Japan Credit Ratings Agency is proof of the government's "prudent use of funds and creative financial management." "These improved credit ratings mean lower interest on our debts. Our innovative fiscal approach has saved taxpayers ₱23 billion ($542.45 million) in the first four months of this year. This is enough to cover the 2.3 million conditional cash transfer beneficiaries for the entire year." Aquino said. Aquino added that as of April this year, the unemployment rate stood at 7.2 percent, slightly lower than last year's 8 percent. He said in the past, most Filipinos foremost ambition was to work in another country. Now, Filipinos can take his pick. As long as he pursues his dream with determination and diligence, he can realize them. However, the President pointed out problems such as job mismatch in local market. Aquino quoted figures of the Philjobnet website as saying, every month there are 50,000 jobs that are not filled because the knowledge and skills of job seekers do not match the needs of the companies, adding, "we will not allow this opportunity to go to waste." But more than that Aquino, who ran and won on an anti-corruption platform, noted his administration remained committed in pursuing the "straight path" - of fighting corruption. He listed down several efforts done by the government to stem corruption including probing questionable deals made by the previous administration, implementing a transparent bidding process for government infrastructure projects and improving tax management by slapping charges against tax evaders. "We are not leaving anything to chance; good governance yields positive results. Think about it: We have realized our promise of providing the public with the services that it needs and implementing programs to help the poor without having to raise our taxes," Aquino said. Evita Jimenez, executive director of the Center for People Empowerment in Governance, said, "it is not yet late for the President to take another route to address the strong clamor for change for which he was elected, he has five years to go in the presidency." 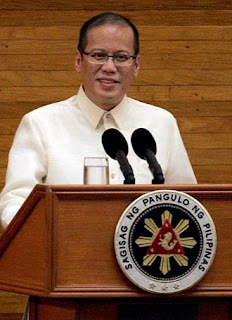 President Benigno Aquino III warned China in a major national speech the State of the Nation Address (SONA) Monday (July 25, 2011) that the Philippines was ready to defend its Spratly Islands claims by acquiring more weapons and would elevate the territorial feuds to a U.N. tribunal. In his State of the Nation Address to Congress, Aquino also announced a Ombudsman new chief anti-graft prosecutor and said his year-old government plans to file its first major corruption case this year against corrupt officials and their accomplices. He did not name the officials but vowed punishment for the guilty. "We do not wish to increase tensions with anyone, but we must let the world know that we are ready to protect what is ours," Aquino said, drawing loud applause at the packed House of Representatives. The address also was televised live to the nation. Aquino noted the efforts to bolster the military's capability, citing the recent purchase of a U.S. Coast Guard cutter and plans to acquire more patrol vessels, helicopters and weapons in deals he guaranteed would be aboveboard. Aquino did not name China in his speech but clearly referred to it in laying a clear claim to the South China Sea feature called Recto Bank, also known as the Reed Bank, where the Philippines alleges China has intruded. "There was a time when we couldn't appropriately respond to threats in our own backyard," Aquino said. "Now, our message to the world is clear: What is ours is ours; setting foot on Recto Bank is no different from setting foot on Recto Avenue." Recto Avenue is a popular street in downtown Manila. The Philippines has said Chinese forces have repeatedly intruded into Manila-claimed areas in the sea since February, including at the Reed Bank. Filipino officials said two Chinese patrol boats threatened a Filipino oil exploration ship into leaving the Reed Bank, which 84.77 Nautical Miles territorial waters and not part of the nearby Spratlys. Two military planes were deployed during the March 2 incident, but the Chinese boats have left by the time the aircraft reached the Reed Bank, 97.55 miles (87.77 Nautical Miles or 150 kilometers) from the Philippine coast. Chinese officials have said there were no intrusions because those in the Philippines shore are belonged to China. The chain of barren, largely uninhabited islands, reefs and banks in the South China Sea or West Philippines Sea are claimed entirety or partly by China, Taiwan, Malaysia, the Philippines, Vietnam and Brunei. The Spratlys is said to be the 4th largest oil and Gas deposit in the World and straddle a busy international sea lane. The Spratlys have long been regarded as Asia's next potential flashpoint for armed conflict. Washington has said the peaceful resolution of the territorial disputes and ensuring the freedom of navigation there were in the U.S. national interest, a position that irked China. The Philippines has said it intends to bring the Spratlys disputes before the U.N.'s International Tribunal on the Law of the Sea. China opposed the plan and wants to negotiate bilaterally instead but the Philippines commented how could we sit together with China when we will face them, they will just say We owned everything the that sea. Aquino said bringing the case before an international arbiter would ensure that "all involved nations approach the dispute with calm and forbearance."